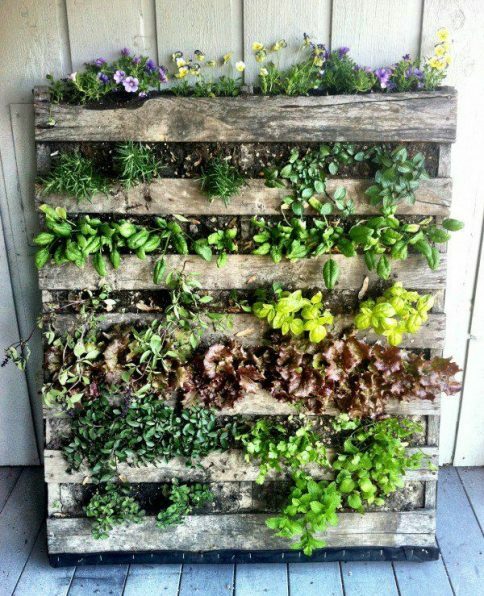 If you are short on space, but love plants vertical gardening may be for you. By growing vegetables, typically vining ones, upwards you use less ground space and instead take advantage of the vertical space available. As a result your yield per square foot increases. Growing vertically also makes pest control and harvest easier because the plants are easier to inspect when they are at eye level. As with all plants location is something to keep in mind. If you are planting a vegetable garden you’ll want a sunny spot with well-draining soil. When planting vertically in a vegetable garden, however, you’ll need to pay special attention to the direction of your trellises. You don’t want the vertical plants to shade other vegetables growing that need full sun. The north side of the garden for tall plants would be best. If you are planning a succulent wall you’ll want a spot that gets partial sun. There are many plants that work well in vertical gardens such as succulents, herbs, vegetables, annual flowers, and vining plants. 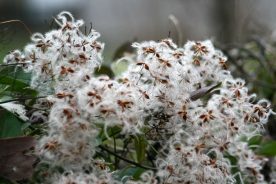 Avoid woody plant such as trees or shrubs. The rigid, woody stems are less flexible than herbaceous plants and will have a harder time growing on the trellis or structure. Select plants that have the same sun requirements and the same growth rates. Plants that grow quickly will shade a slow-grower. The location of your vertical garden will probably help you determine your plants based on the sunlight your selected area receives. If your garden will get partial sun try growing leafy vegetables such as lettuce and cabbage. If your garden will be in the full sun grow plants that thrive in the sun such as tomatoes and peppers. 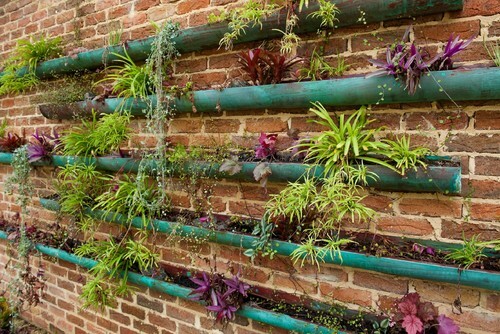 There are many ways to create a vertical garden. Plants are most often grown in containers then attached to a wall or stacked. You can also create a pocket garden with felt or canvas and grow plants in the pockets. Another option is to create a wall garden with slots or panels and the plants are grown in there. These wall can be made with recycled wood or shipping pallets. Most plants and vegetables can be grown in flower pots or containers so an easy way to reap the benefits of vertical space is to place your flower pots on shelves. Be sure to position the shelves so that all the flower pots receive the right amount of sunshine. The best type of shelves to use are those with slats or grates to allow water to drip through to lower containers. This also allows for better air circulation. Assemble your garden so that plants that don’t need as much water are on the top shelves and plants that are the most suited for wet conditions are on the bottom. If you aren’t able to install a wall or trellis or don’t have the space you can use hanging baskets to grow plants. 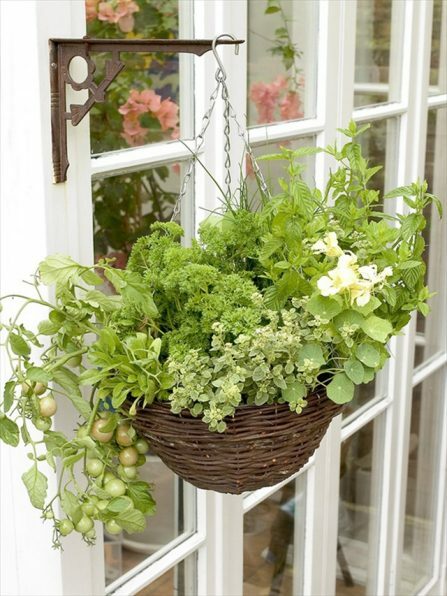 Hanging baskets are great for balconies, decks, or porches on appropriate hangers. Nearly anything can be grown in hanging baskets from herbs, such as basil or parsley, flowering annuals such as petunias or geraniums, vegetables such as lettuce, and ornamental vegetable such as sweet potato vine or flowering kale. Hanging pots tend to dry out quickly because they are more exposed to wind. 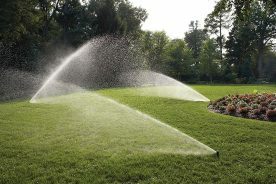 Be sure to keep an eye on the moisture level of the soil; they may need to be watered daily. Trellises are a great way to grow in-ground plants vertically. There many vegetables that love to climb such at beans, melons, squash, cucumber, peas, hops, and some tomatoes. Buy a trellis or build your own. You can use a fence or an old ladder and train the vines to grow around the rungs or posts. 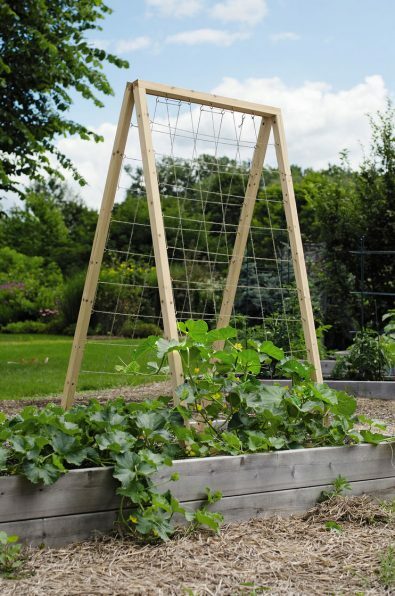 Tie some bamboo poles together to create a frame with strings for green beans. You can even use other plants such as corn stalks or sunflowers. Light-weight vegetables and flowers, such as peas, green beans, or morning glory flowers, can grow around the stalks. Heavier fruits, such as pumpkins and other squash need to be supported as they grow. Create a sling for each fruit and secure the sling to the trellis. If you don’t support the heavy fruit they will ripe off the vine before they mature. Your trellis should be placed on the north side of your garden so it doesn’t shade other plants. Trellises should be anchored into the ground several inches to prevent it from falling over with the weight of the mature plants or the wind. Hanging pocket planters usually consist of a sheet of plastic or felt with several pockets sewn on. The sheet is hung on a fence or wall. Each pocket is stuffed with potting soil and used to grow a plant. Pockets are great for lettuces, herbs, flowers, and other smaller annuals. 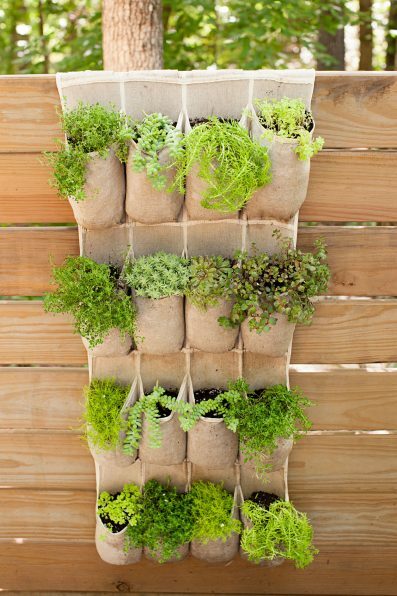 You can purchase a pocket vertical planter or re-purpose a shoe hanger. You can also make your own using landscaping fabric. Depending on the type of fabric used the pockets might not drain well and don’t often have drainage holes. Be sure to pay attention to the soil and don’t over water your plants. 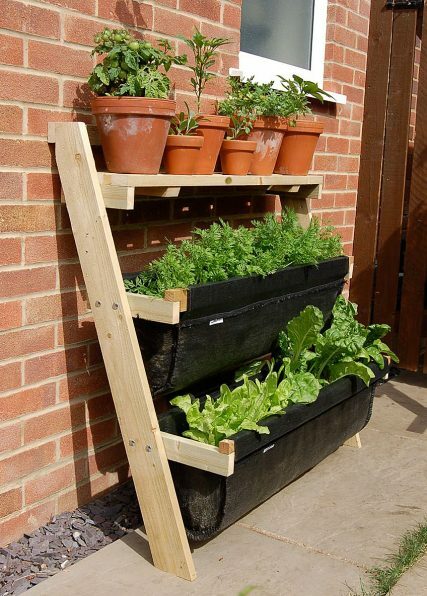 Wood shipping pallets are an affordable solution to vertical gardening. They can easily be found for free. The space between the boards creates sections for growing many plants on one pallet. Staple landscaping fabric or mesh to the back and sides of the pallet so soil does not fall through. Lay the pallet flat and fill with potting soil. Be sure to use potting soil and not garden soil as garden soil is too heavy and won’t drain well. Insert the plants between the slots. Leave the pallet horizontal for a few weeks to allow the plants to establish themselves before moving to a vertical position. That will ensure you won’t lose soil when it is turned upright. The pallet can either be mounted or leaned against a wall or fence. Plants that work well in pallets include strawberries, herbs, annual flowers, and succulents. Rain gutters may be used as a sort of shelf system to grow plants. These would not be the gutters on your house, but new or unused gutters attached to a wall or railing. Mount rows of gutters to the side of a building or fence or hang sections on chains. Before using make sure you drill drainage holes in the bottom then fill with potting soil. Rain gutters are generally shallow so you’ll want to grow plants with shallow roots such as lettuce, herbs, or annual flowers. Gutters can also be used on window ledges and railings.